My grandmother’s older sister is wearing a cameo broach here, but is otherwise unadorned. Lillian Louise Reed was born about 1873 in Lebanon, Kentucky. She was the fourth child of Anna Allen Reed. Her father was Palmer Reed. In 1889, her sister Sarah married James Busby and moved to Benton Harbor, Michigan. On June 10, 1891, Louise married Michigan native, Solonus Shoemaker, in Berrien County, Michigan. She lived the rest of her life there and died in 1938 at the age of 65. Daughter, Mildred, was born in 1899. Son, Floyd 4 years later in 1903. She is buried in Chrystal Springs Cemetery in Benton Township, Berrien County. “Mrs. Lillian Louise Schoemacker, 63 died at 4:30 a. m. today at her home, 693 Maiden Lane. 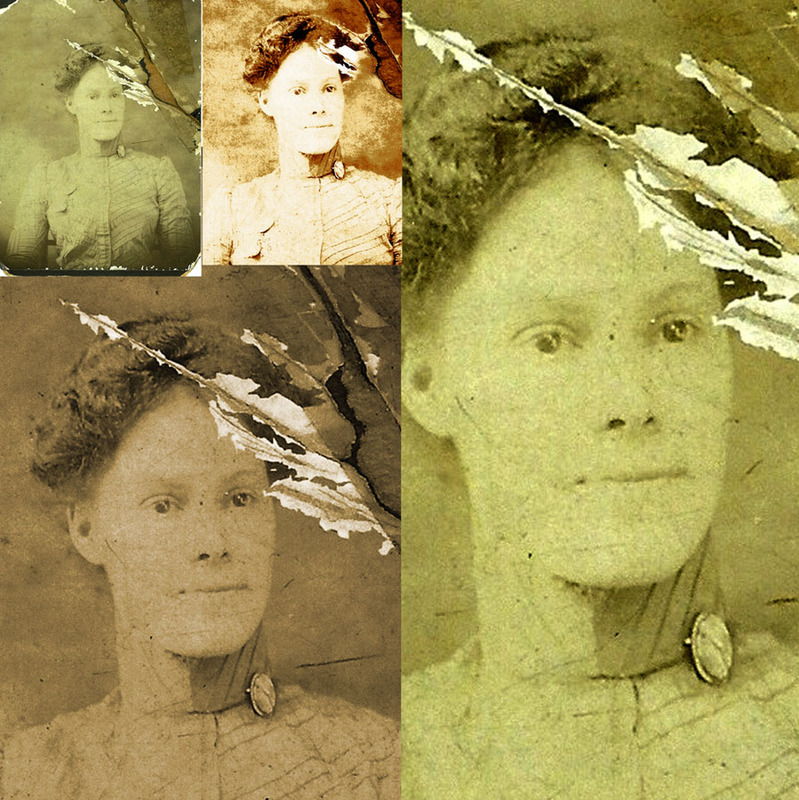 She was born at Lebanon, Ky., October 27, 1874. 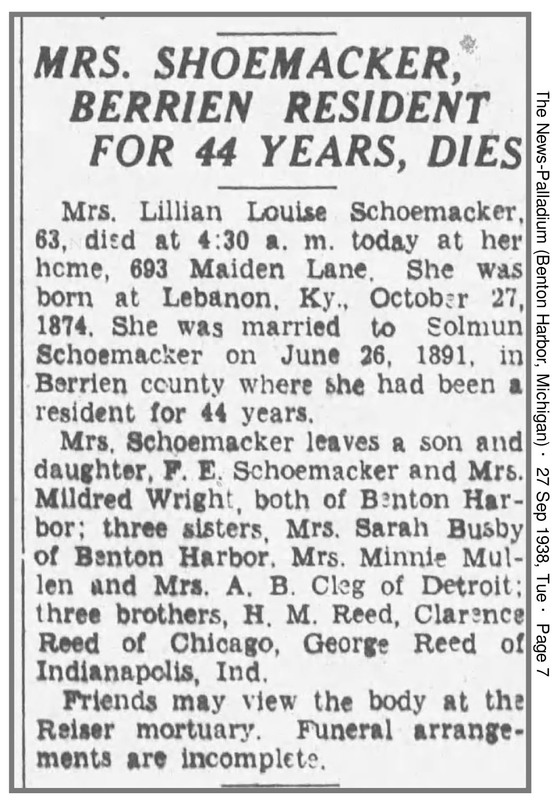 She was married to Solumun Schoemacker on June 26, 1891, in Berrien county where she had been a resident for 44 years. Mrs. Schoemacker leaves a son and daughter, F.E. 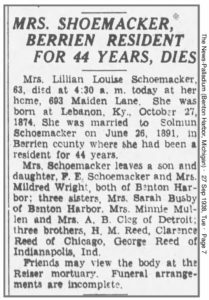 Schoemacker and Mrs. Mildred Wright, both of Benton Harbor; three sisters, Mrs. Sarah Busby of Benton Harbor, Mrs. Minnie Mullen and Mrs. A. B. Cleg of Detroit; three brothers, H.M. Reed, Clarence Reed of Chicago, George Reed of Indianapolis, Ind. Note: The last name is spelled “Shoemaker”. “Cleg” is spelled “Cleage”. For other jewelry laden photographs, or in some cases pet laden, visit Sepia Saturday click the photo below of a woman wearing more jewelry than anybody in my family album wore. The very high collar must not have been very comfortable, even if it did make her look very elegant. It does look very uncomfortable, doesn’t it? Louise had a strong determined look about her, an almost military bearing.I wonder what she was thinking here? I think she needed all the determination she could get. She didn’t have an easy life. I think she has a lovely face. I wonder where the cameo is now. A collar like that would make you hold your head up, uncomfortable I think. She does look very determined and yes that collar must have been very uncomfortable. Beautiful picture! So very elegant, but perhaps not so comfy! Did I mention already, that I really like your header photo, that is especially neat. I do love being able to change the header at will. I didn’t really notice her collar except to admire the cameo until I read the previous comments. Instead, I was drawn to her expression. Louise Lillie was a bright-eyed thing, wasn’t she? Her life was in front of her, full of hope and all still to unfold. great pic! .. get in position and hold that pose….? 1-2 minutes and don’t move? I like the way you combined the photos. I forgot I had done that until I was looking for a copy of the photo before I cleaned it up to share and found the combined photos. I feel somehow that she was really, really proud of that lovely brooch. Delightful photo Kristin. I too often look into the eyes of young women, in photos taken at a time in their life when they had no idea how events would unfold, and my heart skips a beat. Beautiful brooch and very pretty dress… thanks for sharing. The broach makes an elegant accessory. That and the neck remind me of Anne Shirley of Green Gables. Maybe the stiff collar was endured in order to show off the brooch for the formal portrait. As soon as the sitting was over she probably unbuttoned her dress and breathed a sigh of relief (in the privacy of her own bedroom of course!). When once 65 seemed old, now with it clearly in my sites it seems a horribly young age to die. Love her posture and expression. But this pic would be a nightmare to clean up with photoshop. Here is a post with the original and the restoration. I live near Berrien Springs Michigan. Do you have a photo of her tombstone? Or . . .do you even want one? Lovely lady. I don’t have a photo of her tombstone and I would love to have one. I’ve sent you an email with more information.